If you have a garden the size of a jungle like mine, I'm sure you'll agree that the garden is one of the chores you start to dread, cutting the grass can take a good three hours alone, and lets not forget we need to add on another two hours for the strimming around the edges, and a whole day to sort out the plants and weeds! My garden before the work started and before the fence panels - this was just one tiny patch! 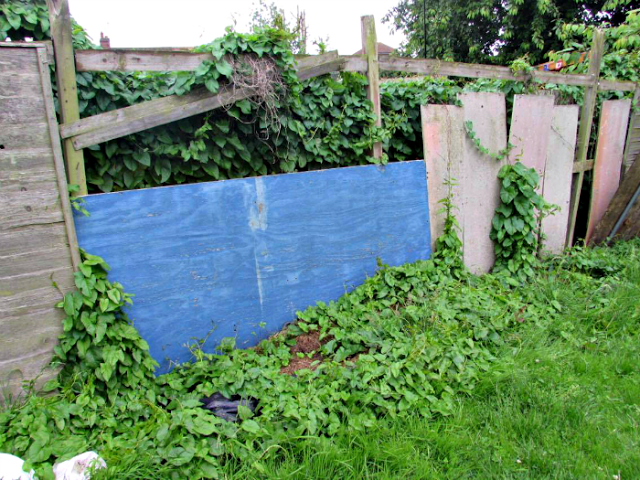 With 29 fence panels in total, a task such as painting the fence is something I try to put off as long as possible, I find excuse after excuse knowing the task in question is going to take me a rather long time, and as we all know - time is precious. I'm sure I'm not alone when I say I'd much rather enjoy the garden then having to work on it, but every week it requires a LOT of time and attention due to the size of it. Within no time I started to become envious of those who can cut and strim their back garden in 30 minutes, I became envious of those who had no weeds - because no matter what weed killer I buy, there's bound to be a new patch of weeds pop up somewhere, and add to the fact I need to make sure they're pet friendly so Zeppi comes to no harm I'm not left with a big range of choices! I even become envious of those with millions, because let's face it if I had the money I'd employ a gardener to sort out the garden for me every working day so I wouldn't have to, having someone to do the garden chores for me would enable me to have the time to actually enjoy the garden - our proper outdoor garden, because as much as I love my IndoorFountainPros.com fountain which will never ever go anywhere, I'd love a huge fountain in the garden too! 3/4 of my garden - look at the patio! I moved in with the patio already laid, my dad said it wasn't done properly hence the grass and weed's growing through it. I've lost count of the amount of times where Spud's been at one end of the garden running about with Zeppi, or enjoying his trampoline or playing with one of many garden games he has, whilst I get lost at the other end of the garden once again tackling the mess that I'd only last done the week before! We waited for so many years for a garden, but I didn't realise how time consuming a huge garden would be. 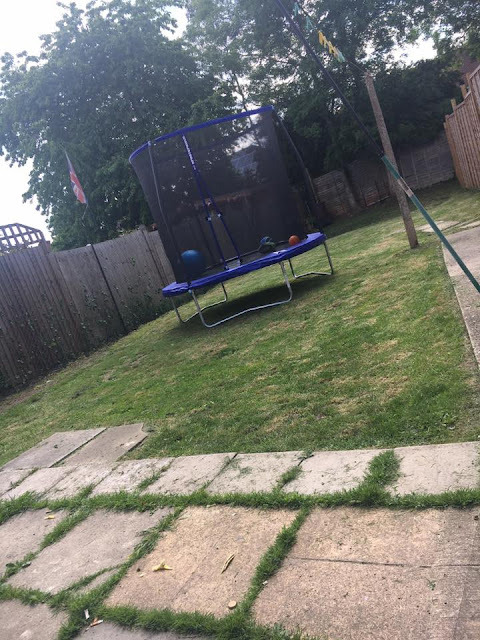 To sort out the issue, to give me more time to be able to witness Spud grow up and create magical memories, I've decided if I can get the money together, the bottom quarter of the garden is going to be made into a play area for Spud (and his cousins and friends when they visit!)! Spud loves to visit colourful playgrounds but doesn't like it when they're packed - which they always are in our area, unless its raining of course! This wouldn't be any playground though, it would be Spud's playground, he would help pick everything from the textures to the equipment, and it will be his very own sensory and ASD friendly playground! We could also get some graphic design added in - maybe even a pretend road that he can ride his scooter around, and we'll get some pretend traffic lights - it will not only be fun, but also help his road safety too. I may even see about getting shelter too, so Spud could enjoy his very own playground no matter the weather! It'll be a win win situation wouldn't it? I'd have less of the garden to worry about - and the bottom of the garden always seems to be the place for new weeds to pop out of and where the grass grows ever so long, and Spud would have his very own playground! Together with the other garden fun items he has like a trampoline and pool, it'll be the best garden he's ever laid eyes on - because it'll all be his! As for the other three quarters of the garden, I'd employ a gardener once a week, just to give me those few hours of being able to watch Spud make magical memories that'll last a lifetime. I best start saving those pennies! Lovely plans for your garden!... You have given me some much needed motivation to get mine sorted out, if only we could afford a gardener!.. we can dream eh!..